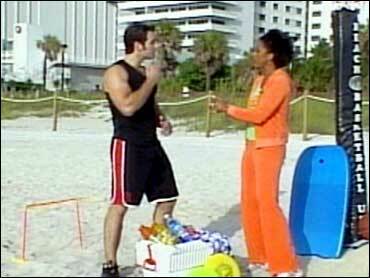 Most people probably view the beach as a place to keep cool and get a tan but fitness expert Kevin Makely says the beach is also the perfect setting for a workout. According to the American Obesity Association, approximately 127 million U.S. adults are overweight and 60 million are obese, Makely explained. So, incorporating fitness in everyday activities is of utmost importance, he said. "Let the beach be your health club," Makely explains. He recommends several activities for getting the most out of a day at the beach: beach basketball, frisbee, running and jogging, walking, swimming, and interval training in the sand, which is moving from hard-packed sand, to deep sand and even on to the boardwalk. This is a great way to charge-up your run and work every muscle in your body, he says. Even the smallest changes in the run can offer huge rewards. Basketball has always been one of Makely's favorites. The game provides cardiovascular benefits as well as muscular endurance work for the shoulder, triceps, chest, shoulders and arms. Another one of his favorite cardiovascular exercises is frisbee, Makely said, but with a twist. For more muscle work, he says, try throwing around a heavyweight frisbee - one weighing 200 grams or more. As for knee problems, Makely said swimming is an alternative 30-minute workout, if basketball and frisbee aren't your thing. He suggests swimming back and forth hard with elaxed kicking in 1-2 minute bursts. Makely is one of the nation's leading celebrity fitness experts, dedicated to reinforcing the importance of both fitness and nutrition in a healthy lifestyle. He has adopted an "all natural" philosophy in helping people reach challenging personal fitness goals. As an certified expert for Bally Total Fitness, Kevin writes for leading national magazines and newspapers and conducts interviews across the country. He has one last tip for beach-goers: don't forget to warm-up and stretch, stay hydrated, dress appropriately, and wear sunscreen, he says.